Skip the tricky carving and let these JackOLantern Metal Stakes by Maple Lane CreationsTM, Set of 2, treat your landscape to bright Halloween style Our exclusive Halloween yard stake is crafted of durable, weatherproof 100 metal by Maple Lane CreationsTM. 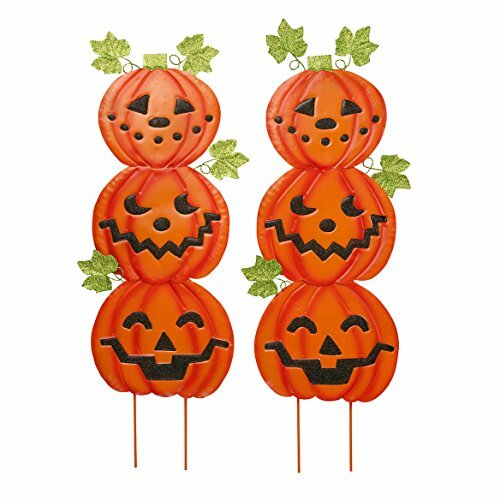 Featuring glittery detail on their cute "carved" faces and dazzling green leaves, both fun pumpkin stacks include sturdy yard stakes for quick display. Simply secure them in the ground and enjoy the fun for many Halloween seasons to come Easy 2pc. assembly. Set of 2. Each 10 1/4" wide x 31" high with stake.